Published statistics on foreign languages in British schools and universities point to a galloping decline, with German leading the charge into the abyss. There are many reasons for the predicament of German, including the perception that it is a highly intricate and baffling language. And while any university syllabus in the subject will go far beyond instruction in the language to include courses on, say, the literature, society, culture and politics of Germany, Austria and Switzerland, these courses themselves usually require a strong command of German. Sadly, the days when such a command could be expected of school-leavers with a good A-level in German are past, and so the quality of university language teaching is increasingly the linchpin that allows the various other wheels of the syllabus to roll along. 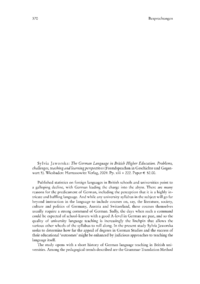 In the present study Sylvia Jaworska seeks to determine how far the appeal of degrees in German Studies and the success of their educational outcomes might be enhanced by judicious approaches to teaching the language itself.